The RFL of SL Charity Fashion Show is an a fundraising event to support Relay for Life of Second Life and The American Cancer Society. 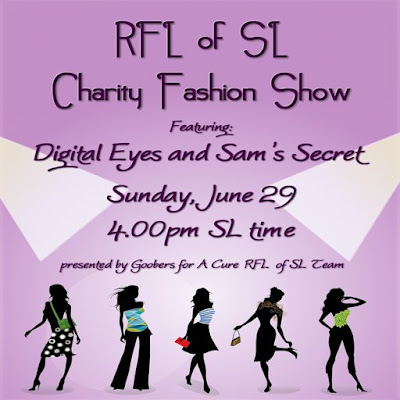 This event is being presented by the Goobers For A Cure RFL of SL Team and sponsored by Sam's Secret Boutique, and Digital Eyes. Each sponsoring designer will have official RFL vendors set up of their clothing and/or accessories. Thanks for the support & Go Relay!